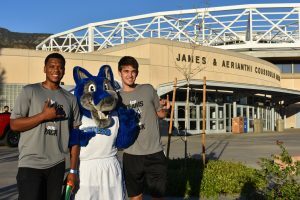 Coordinated by the Office of Student Engagement, CSUSB had its annual Homecoming on Saturday, Oct. 21, as a way to bring students, alumni, staff and community members together to celebrate what it is like to be a Coyote. “The purpose of Homecoming is celebration,” said Alumni Engagement Coordinator, Crystal Wymer-Lucero. Wymer-Lucero says the event is significant because it brings together everybody and it is also a tradition. “We’re here to celebrate what it means to be a coyote and honor everything we’ve done over the last years,” said Wymer-Lucero. This year’s homecoming celebration had over 1,000 members of the Coyote Family. The day was commenced with the Homecoming Bash, which took place at the Coyote Den, near the Coussoulis Arena. There was free food from vendors, including a Beer garden, a kids zone for the family, live entertainment, face painting, crafts, inflatables, a photo booth, carnival rides, games and giveaways. Attendees were able to enjoy delicious food, music, fun competitions, class reunion celebrations and also had the opportunity to give back to their CSUSB community. Frida Guzman is a sophmore student and is part of the SAIL Program which told her about the Homecoming event. “I decided to attend the event because its my school and I wanted to see what other clubs I can get involved with”, said Guzman. Guzman’s favorite part of the event was the photo booth which she had the opportunity to take a memorable picture with her best friend, Grabiela Contreras. Contreras is also a student and was her first time attending the event. “This event influences other students because you get to meet the staff members that are also participating in these types of events and it makes you want to get involved in the community,” said Contreras. Contreras said she would attend Homecoming next year and take her family too. “Homecoming is a time for all students from different backgrounds to come together and have a good time,” said Student Engagement Coordinator, Dion Web. Web said the event is for everyone, especially for the alumni who came to CSUSB and decide to visit the campus. “They can share memories of their time attending here and look forward to the future because each year we are looking to make Homecoming bigger and better,” said Web. Jessica McCullough is an alumni and graduated in 2012. “It’s been a fun time,” said McCullough. McCullough took her kids to the event and was glad there were many fun activities for them. She was also looking forward to the Observatory. “I was here when they put in the Observatory and I have never had the chance to go up there,” said McCullough. McCullough said she was hoping to stay for the Observatory and experience it for the first time. “CSUSB is a great school and I’m loving what they’re doing with the community,” said McCullough. Following the Homecoming Bash was the Coyotes women’s volleyball team at the Coussoulis Arena playing against the Cal Poly Pomona Broncos. Everyone was invited to attend the game and cheer for the Coyotes. Ultimately, was the Star gazing which included a tour of the Murillo Observatory as it is the only observatory in the CSU system. Students demonstrated their equipment and individuals were able to experience the Star gazing for the first time at the Homecoming Bash. Wymer-Lucero believes the event has impacted students because it builds traditions. “Traditions is one of the most important things on a college campus,” said Wymer-Lucero. Along with that, she also said the legacy is extremely important. “Having an event like Homecoming allows us to continue building on our legacy,” said Wymer-Lucero. Wymer-Lucero encourages current students who are about to graduate to come back as an alumni and continue participating in events. “We want them to feel welcomed and comfortable and know that they can come back,” said Web. The coordinators of Homecoming hope to continue improving the event by including new activities to make it bigger and better every year.